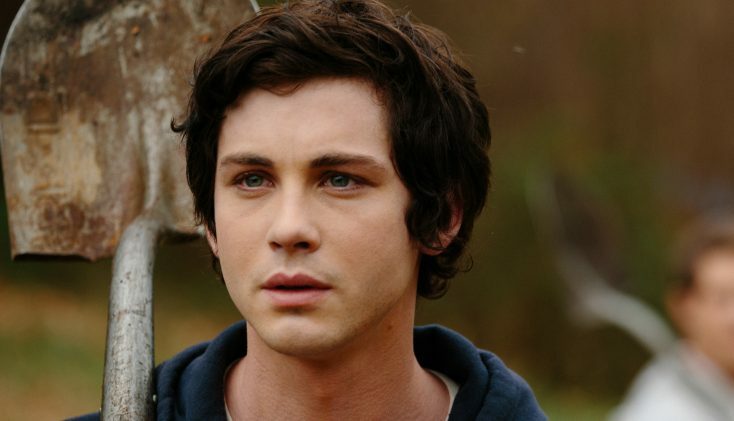 HOLLYWOOD—Former child star Logan Lerman tackles his most demanding role to date in the drama “The Vanishing of Sidney Hall,” co-written and directed by Academy Award winner Shawn Christensen (writer/director of the 2012 short film “Curfew”). Now 26, the Los Angeles native believably plays the titular character, a once best-selling young novelist whose mysterious disappearance after the publication of his second book raises questions in literary circles and inspires one man to search for him, over the span of 12 years. The actor spoke about tackling the role of fictional novelist Sidney Hall that required him to play the character at three phases of his life: as a young high school student bullied by a bigger kid, a young successful novelist coping with the overnight success of publishing a bestselling book and as a regret-filled and bedraggled adult riding rail cars with his dog. The film also stars Elle Fanning (“Ginger & Rosa”), Michelle Monaghan (Hulu’s “The Path”), Nathan Lane (“The Producers”) and Kyle Chandler (Netflix’s “Bloodline”). “The Vanishing of Sidney Hall” was shot on location in New York and New Mexico about a year and a half ago. Q: You play this character basically at three stages of his life. Which was the most challenging for you? Lerman: There were different challenges. From an emotional, character standpoint, I started thinking about what was the most interesting to me. Challenging is fun. It’s all challenging. They were all interesting. It’s hard to pick. There were three very distinct stages in this guy’s life and things going on. I would say going back to the purity of the idealistic teenager might have been a bit more challenging at this point in my life; the 18-year-old segment when he is definitely more idealistic and youthful. To explore that part might have been slightly more challenging for me. Q: Where do you want to be at 30? Lerman: I don’t have that long-term goal set. My goals are set week-by-week and day-by-day battles but I would say I feel lucky to be able to be making movies and to be in a position where I’m considered for projects and hopefully, four years down the line, I can continue producing and acting and being a part of productions in any capacity. Just to continue finding stories that I think are worth devoting my time and energy to sheparding into production and championing writers. It’s interesting, the state of film right now. So, I wonder where I’ll land and what I’ll be doing. Q: Sidney has a difficult relationship with his abusive mother, played by Michelle Monaghan. At one point, you two even get into a physical scuffle. What was it like getting beat up by her? Lerman: She really hit me hard but (what Monaghan did) was appropriate. It was great. You do what you need to do and that’s what the scene required. We all want to find the truth and interesting moments and we’re ready to do what it takes. It’s easy when you are working with somebody you really respect and like so (filming that scene) was easy. She can hit me anytime. Q: Did you add prosthetics or gain weight to play Sidney at 30? Lerman: Yeah. When we first started talking about the film, one of the first conversations was scheduling and how do we turn our money into days? We had all these grand ideas like, “We can start the film and shoot for a few weeks or a month then take a month off and lose all this weight or gain weight and cut hair or grow hair out and go back and take another month off.” Of course, that didn’t work out. It was unrealistic with everyone’s schedules. So, we had to figure out how to make it work with quick turn-arounds within hours to try to change the ages. There were some tricks; a little fat suit, which I still have and wear. Q: What? Where do you wear it? Lerman: When you’re an actor and you’re going into meetings with filmmakers, often they like to see the character. So, sometimes, if I don’t have the weight on at that particular time, it’s nice to put on a little body suit that we made. (For “Sidney Hall”), we did a lot of screen tests trying to make the transitions, like the fake beard and wigs. We went through a long process of trial and error. Q: Your body language really sells it. Was it like creating a different character for each time period? Lerman: I tried to figure out what was happening during that period of time and what was happening when (the viewer) last saw the character and that’s fun work. I wish I could show you photos of the first attempts because they were so bad and we made them much better. We got really lucky that some great (make-up) artists came and decided to work for free in between their jobs on “Avengers” films and stuff like that. Everybody in the industry is excited about original stories so when a production like this is around the corner, I think everybody wants (to do it). Q: Sidney Hall burns his own books even though they are popular with young adults. Have you ever regretted any of your successes? Lerman: I’ve learned way more from my failures. In a way, those are precious and sometimes more valuable to my growth than the times when everything’s worked out and I’m like, “I have no idea why this worked.” You want the experience more than anything. I can tell you about films that are considered good work and sometimes the experiences have been unenjoyable or I’ve felt like weren’t well-managed productions and they might be some of the better work I’ve done and I value that as much as some of the others. There’s a difference between Sidney, who is a novelist, who created a thing that is his responsibility. That is something I can’t relate to because a film is collaborative. I didn’t write the script. I’m just trying to realize the filmmaker’s vision so, if it doesn’t work out, I’m slightly separated from it. Q: Sidney realizes that his novels have—for better or worse—impacted people. What book has been the most pivotal in your life? Lerman: It’s funny. There are a lot of books that had a great impact on me. None that I revisit because I don’t have the time. It’s a shame that in the last couple of years I don’t read for pleasure as much. As a producer, you’re always looking at what’s out there trying to find material, a lot of it is in screenplay format and specs and novels that maybe nobody has the rights to. But the one book that that I’ve revisited is Sidney Lumet’s “Making Movies.” That’s an important one for me. One of the greatest parts about my education in film has been working on movies and learning from others’ mistakes. A prolific filmmaker like Sidney Lumet has made some fantastic films and some not so fantastic films. You can learn from his mistakes and his successes and how he approaches every aspect of a production from rehearsals to post-production. It was probably the best insight and useful information. If you are interested in film, that’s probably the most influential book in terms of shaping me as a filmmaker. “The Vanishing of Sidney Hall” will be released in theaters Friday March 2 from A24. It also is available on DirecTV. Previous PostPhotos: Original ‘Tomb Raiders,’ ‘Darkest Hour’ ‘Coco,’ More on Home Entertainment … Plus Giveaways!! !